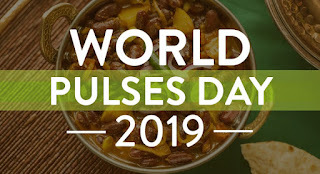 February 10th, 2019, was celebrated as the first World Pulses Day. The Year 2016 was celebrated as International Year of Pulses to highlight the contribution of Pulses to sustainable food production and towards food security and nutrition. Building on the positive momentum of the International Year of Pulses, the UN General Assembly passed the resolution to celebrate 10 February as World Pulses Day to keep the positive momentum surrounding these healthy, nutritious, protein-rich, nitrogen-fixing legumes alive after the FAO's successful 2016 International Year of Pulses Campaign. Pulses are a type of leguminous crops that are harvested solely for the dry seed and does not include crops that are harvested green (e.g. green peas, green beans). Dried beans, lentils and peas are the most commonly known and consumed types of pulses. Pulses include all varieties of dried beans, such as kidney beans, lima beans, butter beans and broad beans. Chickpeas, cowpeas, black-eyed peas and pigeon peas are also pulses, and are all varieties of lentils. Pulses are packed with nutrients and have a high protein content, making them an ideal source of protein particularly in regions where meat and dairy are not physically or economically accessible. Pulses are also low in fat and rich in soluble fibre, which can lower cholesterol and help in the control of blood sugar. Pulses also aid in combating obesity. The nitrogen-fixing properties of pulses improve soil fertility, which increases and extends the productivity of the farmland. Pulses, when used for intercropping and as cover crops, promote farm biodiversity and soil biodiversity, while keeping harmful pests and diseases at bay. Pulses contribute to climate change mitigation by reducing dependence on the synthetic fertilizers used to introduce nitrogen artificially into the soil. This reduced use of synthetic fertilizers will reduce greenhouse gas emissions during their production. Q. What was celebrated as the first World Pulses Day?